Fayyaz, thanks for taking out some time for this interview and sharing your insights and what you’ve learned along the way. Ubertheme: First of all, tell us a bit about your early days with Magento and what challenges did you face initially? Fayyaz Khattak: I started my career as a PHP Developer. I had worked with multiple teams to learn and ensure that my code quality is acceptable and logical for the implementation. My first Magento project was a multivendor store with a very short deadline. I had never built a single ecommerce store previously, so I searched for the best platforms to build a scalable ecommerce store. Magento was a fair choice. So, I checked all the possible options available and decided to go with it. Magento offered everything to integrate in no-time. Specialist web hosting providers, themes, extensions, guides, and a robust online community to help with learning the platform. I followed the official Magento documentation guide for building the store. I also asked a LOT of questions on StackOverflow and also helped others by offering solutions that worked for me. This decision has served me well, and I continue to enjoy the challenges and opportunities that working with Magento offers. As all these challenges usually lead me to success. There is nothing more fulfilling than to solve a complex problem or to help someone else do the same. Ubertheme: How did you start with Magento 2, and why did you choose UB Data Migration Pro for Magento migration? 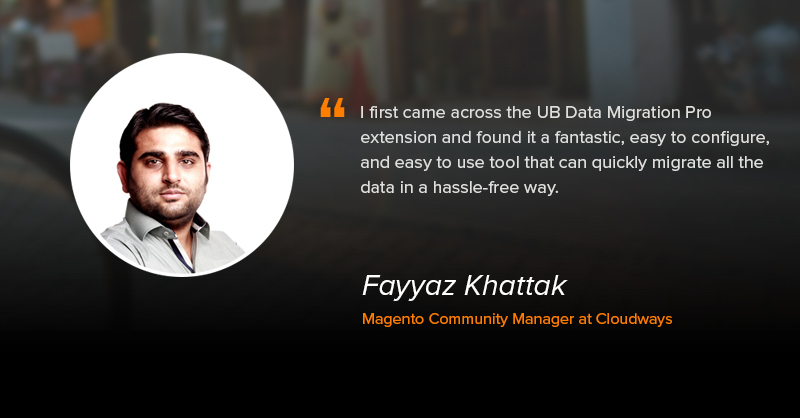 Fayyaz Khattak: In 2016, I was hired as a Magento Community Manager by Cloudways. Here I first came to know about Magento 2. Since it was early days of Magento 2, I started learning the platform and enhanced my skills time-to-time. As a Magento Community Manager, I always learn and share about PHP & Magento development with the community. I love to educate community members by writing blog posts, talk to them over call or chat, answer to their questions and queries, and help to solve Magento related issues of all those who are in need. A few days ago, I was contacted by the Founder & CEO of A&H Digital Solutions on LinkedIn. 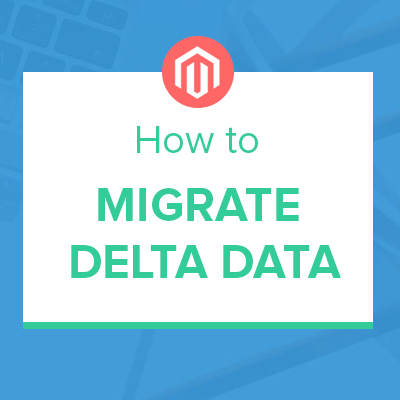 They have found my article on Magento Data Migration a great help, and they were stuck in a dilemma where they had to migrate from Magento 1 to Magento 2. They sought my help for migrating the data using UB Data Migration Pro extension. At that time, I first came across the UB Data Migration Pro extension and found it a fantastic, easy to configure, and easy to use tool that can quickly migrate all the data in a hassle-free way. Ubertheme: What was the brief for your Magento 2 data migration project? Fayyaz Khattak: It was a medium sized project with more than 15,000+ Sales Orders. The primary goal was to make sure the data is appropriately migrated, and it is accessible without any errors. The scope of data was limited to 2 Stores, 2500+ Customers, 130+ Categories/Sub-Categories, 2500+ Products, and 15,000+ Sales Orders. Ubertheme: What has been the biggest challenge for you with the new Magento 2 platform migration? Fayyaz Khattak: The client has customized the database structure a lot using third-party extensions. As we all know, we can’t migrate Magento 1 extensions directly to Magento 2 because of compatibility issues. So, according to the client’s needs, we arranged, and developed custom Magento 2 extensions that helped modify the schema of the tables as per requirement. Without these extensions, we would have been stuck facing multiple errors, i.e. “No such entity” or “PHP Fatal Errors” etc. We also had to change the PHP or web server configuration according to our needs because during the migration process, there were chances of the timeout, data size limit and many others. Ubertheme: How UB Data Migration Pro helps you complete migration? Fayyaz Khattak: Personally speaking, I got the whole migration process covered using the UB Data Migration Pro extension. Ubertheme: In your experience with M2 migration projects so far, have you found any common pitfalls that developers will need to watch out for? Fayyaz Khattak: Yes, of course! I would suggest migrating data on fresh Magento 2 installation. Do not try to install any theme or extension first. It is always recommended that first migrate the data and then do the rest of the work.